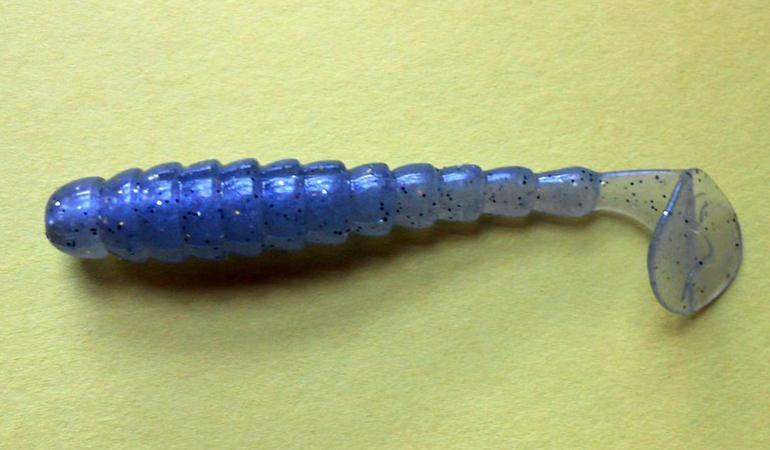 During the past decade, the three- and four-inch curly-tailed grub has been slowly replaced by a small swimbait in the repertoire of an array of Midwest finesse anglers. The ExoSwim Swimbait, which is the creation of BioSpawn Lure Company of Chicago, recently caught our eyes, and we solicited information about it from Josh Slawkin, Eli Rosenberg, and Andrew Schreiber at BioSpawn and Catch Co. They quickly answered our questions and sent us a dozen ExoSwims to examine, measure, work with, and describe. They also put us in touch with a member of BioSpawn’s pro staff. It is a solid-body bait that is 4 5/16 inches long from the tip of its head to the end or bottom of its paddle-style tail. Its head is dome shaped. It is a quarter of an inch long. At its widest spot, which is at the junction with its torso, it is a half of an inch wide with a circumference of about 1 3/8 inches. Its epidermis is smooth. The torso is three inches long. It is adorned with 11 pronounced segments. The first seven segments are round and tapered. The final four segments become flatter, and they are somewhat oval shaped. The third segment is the largest of the lot; it is a quarter of an inch long and nine-sixteenths of an inch wide at its widest spot with a circumference of 1 11/16 inches. The width and circumference of the torso diminishes as it approaches the tail. Segment number 11 is a quarter of an inch wide at its widest spot with a circumference of one inch. It is seven-sixteenths of an inch long, which is three-sixteenths of inch longer than segment number three. Along the torso’s dorsal area, there is a hook slot that stretches from segment number two to segment number six. This slot is 1 1/8 inches long and one-eighth of an inch wide. Along the torso’s ventral area, there is another hook slot that stretches from segment number one to segment number seven. The tail consists of a flat and thin flange that is connected to segment number 11 of the torso and to a flat and thin paddle or boot. From its junction with segment number 11 to the junction with the top of the tail’s paddle, the dorsal area of the flange is nine-sixteenths of an inch long. At its junction with segment number 11 of the torso, the flange is a quarter of an inch wide and one sixteenth of an inch thick. The ventral portion of the tail’s flange is curved, and from its junction with segment number 11 to the junction with the bottom of the tail’s paddle, it is an inch long. As the flange joins the paddle, it is seven-eighths of an inch wide and one-sixteenth of an inch thick. The paddle exhibits somewhat of the shape of a reniform leaf. From the top of the paddle to its bottom, it is seven-eighths of an inch long, which is called its major axis. It is seven-eighths of an inch wide at its widest spot, which is its semi-major axis. The epidermis of the tail’s boot and flange is smooth, but there is the letter S embossed on the outside portions of the tail. ExoSwim’s designers say that the combination of the tail’s paddle and the 11 segments of the torso creates a series of lifelike movements. Anglers can affix it to an Alabama rig, chatter-style bait, drop-shot rig, spinnerbait, swim jig with a skirt, swim jig without a skirt, underspin, weighted swimbait hook, and wobble jig. It is manufactured in the following colors: Electric Shad, Feider Shad, Green Gizzard, Green Pumpkin, Lab Magic, Pearl Flash, and Pro Blue Red Pearl. Fifteen percent of its body weight is impregnated with salt, and it is not buoyant. It is also impregnated with BioScent, which consists of anise, amino acids, and fish oils. (1) We asked Josh Douglas of Isle, Minnesota, who is a member of BioSpawn’s pro staff, a veteran guide, and successful tournament angler, about how he employs the ExoSwim. In the spring when the black bass are abiding in shallow-water haunts, he affixes the ExoSwim to either an 1/8- or 1/4-ounce Outkast Tackle’s Golden Eye Swimmer jig, which is a jig that he designed. Late in the summer and through fall, he works with the 3/8-ounce Golden Eye Swimmer jig. It allows him to more effectively probe deeper environments. The 3/8-ouncer also allows him to execute longer casts when he has found a concentration of black bass that he does not want to spook by getting too close to them. Most of the time, Douglas presents it to the black bass with a swimming presentation. But when his swimming retrieve is not fruitful, he will drag through and across rocky terrains. He notes that the Golden Eye Swimmer jig was designed to dive, and the weight is positioned in the underbelly of the bait, which helps to make it relatively snag-free in rock-laden environs. Instead of wielding a topwater lure, Douglas will often use the 3/8-ounce Golden Eye Swimmer jig with the ExoSwim, and he will employ what he calls a burning retrieve that traverses slightly under the surface. During this retrieve, he will execute what he calls a killing motif, which is accomplished by quickly stopping the rotation of the reel handle and allowing the ExoSwim to plummet towards the bottom. When he is working around a school or concentration of black bass, he will perform the killing routine twice. The first kill is in the area that the black bass are situated. The second kill occurs when the ExoSwim is a goodly distance away from the school, and it is aimed at alluring a black bass that might be following the ExoSwim, and as it plummets towards the bottom, it sometimes provokes a follower to engulf it. He always employs a Golden Eye Swimmer jig with a 4/0 hook. When Douglas affixes the ExoSwim to a skirted swim jig, he will shorten it by amputating a portion of its anterior section. (2) Here is a link to BioSpawn’s website: https://biospawn.com/products/exoswim. (3) As we have noted scores of times across the years, Midwest finesse anglers are inveterate customizers. And many of them will use a pair of Fiskar scissors to amputate the ExoSwim’s head and a few of the segments of its torso’s anterior before they affix it to a jig. They will also use a smaller jig with a smaller hook than the one that Josh Douglas prefers to use. Most Midwest finesse anglers prefer to work with a 3/32-ounce jig, and there will be times when they opt for an 1/8-ounce jig. A slightly shortened Feider Shad ExoSwim affixed to an unpainted 3/32-ounce mushroom-style jig. Most of their retrieves will be a straight swimming presentation, but all six of the standard Midwest finesse retrieves will be effective at times with an ExoSwim. Here is a link to a Midwest Finesse column that explains how we employ those retrieves: //www.in-fisherman.com/listing/learn-midwest-finesse/83225.